Iron makes 0.334% of the weight of haemoglobin in all species. Thus haemoglobin is a defined molecule with a molecular weight of n * 16700.
isolates haem by treating haemoglobin with NaCl/glacial acetic acid. The protein remains as colourless precipitate, the haem can by crystallised from the solution. suggests the name haemoglobin and crystallises it (first crystallisation of a protein). measures oxygen binding to haemoglobin as function of oxygen and carbon dioxide concentration. discovers the tetrapyrrol-ring structure of haem. In the following year R. WlLLSTATTER finds a similar structure in chlorophyll, but with Mg instead of Fe as central atom. describes oxygen binding as equilibrium reaction with monodisperse haemoglobin, the binding constant depends on the animal species used. investigates the influence of pH on the oxygen binding curve. The results are interpreted by J.B.S. Haldane (son of J.S. Haldane). determines the molecular weight of haemoglobin to be 65 kDa by measuring its osmotic pressure. He also discovers that oxygen binding to haemoglobin is a co-operative process. discovers the coordination of iron with amino acid side chains in haemoglobin. synthesise haem. measures the molecular weight of haemoglobin with his newly developed ultracentrifuge and finds haemoglobin to consist of a single, well defined molecule. isolates HbF and compares oxygen binding curves of adult and fetal haemoglobin. show that all haemoglobin molecules have the same end-groups. solve the 3-dimensional structure of haemoglobin by X-ray crystallography. 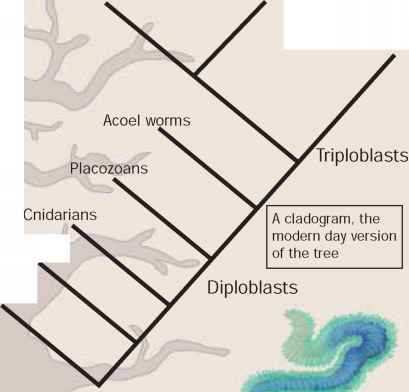 Figure 7.1. Binding of haem to myoglobin. a) Haem is a flat molecule with iron at its centre. The iron is held in place by complex bonds to the 4 ring nitrogen atoms. The remaining 2 coordination sites of iron are oriented perpendicular to the haem ring system. b) One of these binds to a His residue of myoglobin (called the proximal His), the second binds the oxygen molecule. Binding of oxygen to haem is stabilised by a hydrogen bond to a second (distal) His residue. Note that the axis of the oxygen molecule forms an angle with the Fe-O bond, in case of the poison CO the system would be straight. The subunits of haemoglobin have a similar structure, the proximal histidines are His-87 in the a- and His-92 in the ,3-subunit. oxygen transport protein in erythrocytes, contain haem as oxygen binding site. Haem is a porphyrin molecule with Fe2+ bound in its centre. Because it is buried deep in a small pocket inside the protein without direct access to the medium, haem can not leave the protein. Such firmly bound molecules in the active centre of a protein are called prosthetic groups. - Free iron can catalyse the formation of reactive oxygen species, which are dangerous to cells. Iron bound inside myoglobin or haemoglobin has a significantly reduced tendency to do that. - Free haem has an extremely high affinity for some poisons, like nitric oxide and carbon monoxide. Carbon monoxide binds about 20000 times better to free haem than oxygen, while in myoglobin it is only 200 fold better. The reason is the different orbital geometry of oxygen and carbon monoxide; while the axis of the O2 molecule forms an angle with the Fe—O bond (see fig. 7.1), CO binds perpendicular to the haem ring. Steric hindrance by the distal His-residue reduces the affinity of haem for CO in myoglobin and haemoglobin. - In free haem oxidation of the iron centre to Fe3+ destroys the oxygen binding site. The iron-histidine bond seems to protect the iron centre against oxidation. - In a protein the affinity of haem for oxygen can be controlled by protein conformation. As we will see in a moment, this has important physiological consequences. 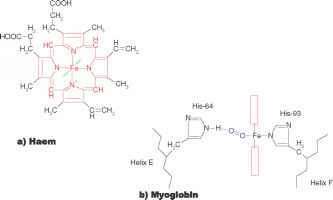 Myoglobin is a monomeric protein with a single haem group. Haemoglobin however is a heterotetrameric protein (2 a- and 2 p-subunits in normal adult haemoglobin), each of the subunits has its own haem. And this apparently small difference has important consequences. Figure 7.2. Three-dimensional structure of haemoglobin, in stereo (PDB-code 1HGA). The molecule consists of 2 protomers, each containing an a- and a ,3-subunit. The 4 haem molecules are in protected cavities inside the subunits.